The DF-A0037 and the OMNI-A0205 can be combined to create a Marine rated rugged DF and Monitoring system. The DF-A0037 is a wideband DF antenna suitable for rugged marine environments. Based on the more portable DF-A0029 product, the rugged version features upgraded mechanical and environmental features to improve performance when mounted on a vehicle. The antenna has a loop array for good DF performance at low frequencies where the phase size of the array is small, and two pentagonal arrays for the middle and high frequency ranges. Secondary pentagonal arrays of dipoles and monopoles provide good omni-directional antennas up to 3.6 GHz when appropriately combined. A HF whip on top of the antenna provides a sensitive omni output for this band. This vertically polarised omni-directional antenna consists of an active antenna array, covering 20 to 6000 MHz. 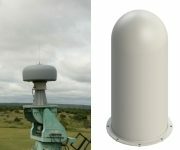 The antennas are combined under 1 compact radome and output in either a single (OMNI-A0205-01) or two connectors (OMNI-A0205-02). The active part of the antenna protects the system from excessive field strengths and boosts low level signals. The active version of this antenna relies on DC power injection on the output port of the antenna. The antenna is best utilised with the MISC-A0022 power supply for this purpose. The OMNI-A0205-01 features a passive-bypass mode which is engaged when the antenna is not powered. In this mode, the antenna is completely passive, allowing for low distortion measurements in the presence of high incident fields. Based on the OMNI-A0098, the antenna is mechanically hardened to withstand the harsh environments experienced in maritime environments. For more information, contact sales@alaris.co.za.